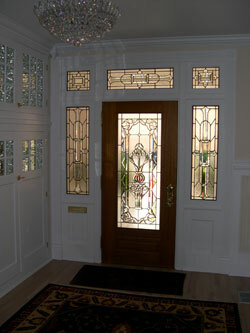 Williams Stained Glass is an authorized dealer for GlassCraft Door Company. Visit www.gcdoor.net to see the selection we have to offer. We can custom design stained glass door panels, transoms, and sidelights for any of the doors GlassCraft offers, or for your existing doors. We offer expert installation in the Tri-State area. Thermopane options are available on any project.